Brand New Eco-Friendly 5 Bedroom Ocean View Home with Private Trail to a Secluded Cove Beach \n\nCasa Soleluna delivers a beguiling ocean vista, unique access to a secluded beach, and unparalleled quality in an understated yet compelling style. Exquisite in scale, finishes, and orientation, the seller built this home as if for himself, sparing no expense. This is the right home for the discerning buyer with taste and a good eye for quality. \n\nStep into the home and find yourself in the open concept common living/dining kitchen area facing a bank of the wall to ceiling folding glass doors opening onto the pool area, a spacious terrace, and the sublime view of the ocean and mountains beyond framed by lush jungle. Every feature, every room, all the terraces, and the pool have been designed to embrace this wonderful vista. One could while away hours simply watching boats in the distance as the sun sets. \n\nAll five bedrooms have full en suite bathrooms. Yet it’s the master bedroom on the second floor that takes the notion of en suite bath to another level with both the bath and shower oriented to exploit the full view of the ocean. \n\nAll but 1 bedroom features 50” smart TV’s, ample closets, and walkout terraces facing the ocean. The fifth bedroom, just beyond the kitchen on the main level, is smaller and equipped with bunk beds, just right for kids. The main floor master bedroom, adjacent to the living area, is perfect for anyone not wanting to navigate the stairs to the second floor where one finds three full bedrooms and plenty of closet space. \n\nThe large open-concept living area is airy and welcoming. The chef\'s kitchen includes high-end stainless-steel Café appliances, granite countertops, and a large two-level island with breakfast bar graced with a beautiful etching of a sea turtle on the front. Just off the kitchen, the dining area has an expanding dining table that comfortably seats eight people. \n\nThe impeccable taste governing all the choices taken in the construction of this home is evidenced in the visual and practical details such as the integrated German window system; the imported Italian tile and marble found throughout, and the precious Costa Rican wood finishes master crafted by top woodworkers in the area. The neutral palette provides a gracious canvas upon which the new owner can add his or her personal imprint. Bring your accent color to the fore with soft furnishings, art, and mementos which can have a place of pride on artfully placed floating shelves throughout. \n\nThe house is extremely generous with storage and closet space. A full laundry room provides a great space for getting the home chores done. \n\nThis home is eco-friendly with solar panels lining the roof and able to store enough power for up to 10 hours, a helpful feature during a power outage. 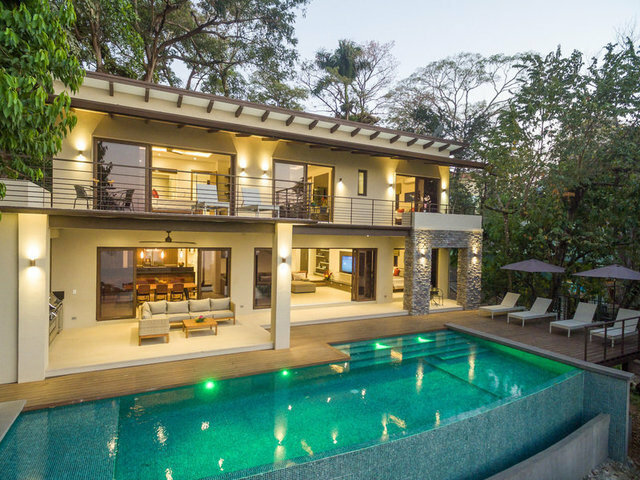 \n\nLocated in the heart of lovely Manuel Antonio village and is within 5 minutes of the best restaurants, bars, and shops, the home nevertheless provides excellent privacy.